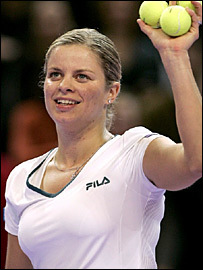 Second seed Kim Clijsters booked a quarter-final spot at the Diamond Games in Antwerp after easily overcoming Russian Olga Poutchkova. The Belgian won 6-0 6-2 in her final event on home soil after her decision to retire at the end of the season. "I felt good and the crowd were brilliant as always. I was a little nervous but it passed," said Clijsters, who said that she is nursing a cold. "I am just focusing on the next game. I will have to move up a gear." Clijsters will now face either eighth seed Ana Ivanovic or Nathalie Dechy of France in the last eight, following Ivanovic's 6-3 6-2 first-round win over Anastasiya Yakimova. Fifth seed Patty Schnyder lost out to France's Tatiana Golovin, who came from a set down and saved four match points to win 6-7 (2-7) 7-6 (7-5) 6-2. Golovin will meet either fourth seed Elena Dementieva or Elena Likhovtseva in the next round. Seventh seed Anna Chakvetadze came from behind to defeat Austria's Sybille Bammer 4-6 7-6 (7-4) 6-2 to seal her quarter-final place. The Russian will now face third seed Nadia Petrova or Vera Zvonareva, who play on Thursday. Sixth seed Dinara Safina defeated Michaella Krajicek of the Netherlands in straight sets 6-2 7-6 (7-4). Top seed Amelie Mauresmo starts her campaign with a second-round match against compatriot Virginie Razzano on Thursday.